Kirtland's Yarn Barn of Andersonville is an independent, family owned and operated, yarn shop in Andersonville, Virginia, with a wide variety of yarns, knitting and crocheting patterns, books, tools and notions. From 1971-1998, we were located in Delaware, Ohio. We are not affiliated with any other Yarn Barn. Yarn – single balls, your choice, various prices. Yarn Pacs – yarn for a specific design. We may offer the pattern/book as an additional purchase. 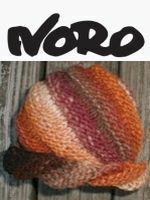 Kits – usually include the yarn and pattern; sometimes include any required accessories. Many knitting and crocheting books and patterns. Unless a download option is offered, books and patterns can not be sent by email or downloaded. Complete line of knitting needles and other tools. We DO NOT carry weaving supplies. That is another, independent, Yarn Barn. Our store is located on Andersonville Rd. (Rt. 640) in Andersonville, Virginia, about 70 minutes west of Richmond, 45 minutes south of Charlottesville, 45 minutes east of Lynchburg, and 20 minutes north of Farmville. If you live in Central Virginia or are driving through, come pay us a visit! It's a pleasant trip out into the country, near 3 state parks if your family wants something to do. Normal hours: Monday - Saturday, 9:00am - 5:30pm (US Eastern Time). Please call before you visit. Sometimes we are away from the store during the day, e.g. for doctor's appointments. Ph. +1-800-850-6008 or +1-434-983-1965. We (Y) are located on Andersonville Road (Route 640), about 6.3 miles southwest of Sprouse's Corner (S). My husband's business, Kirtland Woodworking, is open, and he can be reached at +1-434-983-2327. He is restoring and refinishing antiques and doing custom woodworking. He is providing me with completely adjustable woolly boards, vertical swifts, cedar bobbins for storing with woolen sweaters, and darning eggs.